Audubon (or Audubon Circle, as I only just, after 6 years of patronage, discovered is this establishment’s proper name) is the kind of place that grows with you. For example, what I used to regard as my bar around the corner in graduate school, perfect for drinks and a burger after a midterm, morphed into a reunion spot after graduation. 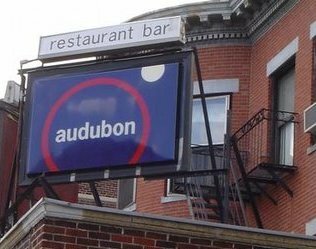 As more time passed, Audubon became a regular meeting place before a night out at a Red Sox game, or an evening of dancing. Now, older and less inclined to stay out until 3am, Audubon has grown with me again, revamping its menu to include excellent entrees and more sophisticated drinks (which, post grad school, SB and friends can now afford), providing a low key venue for a weeknight chat and dinner, a first date, or a home base for a saturday night gathering for a round of moscow mules. Audubon is just close enough to the green line and Kenmore Square to be convenient, but just far enough away that it is rarely uncomfortably crowded. * They have an outdoor patio on which you can dine or just drink, and for those that still smoke, have at it. The bar area itself has ample seating, and the service is always fast and very friendly. Mixed drinks are prepared expertly, but be a pal and don’t order a mojito – its a pain for the bartenders to make, and mojitos are pretty much over, anyway. The beer list is seasonal and relevant, and the staff is happy to make recommendations. Another bonus about Audubon- the bathrooms are always very clean and well kept. Take advantage of them if you plan to hit another bar- or worse, Fenway- later in the evening. And yes, sports fans, they do have several flat screens- you don’t have to miss a second of the game. I was a die hard Audubon burger fan for many years, and while the burgers are still good- served with a side of potatoes and the rare perfect bun- I’ve moved on to their newer offerings. I’ve tried the beef shin quesadilla several times in an attempt to figure out the flavor note that I can’t quite identify. Whatever it is (mint maybe? ), the meat is moist and not stringy, good as a meal (if you have a lighter appetite) or a shared first course. The white bean puree and the potstickers are perennial favorites among FoSBs, excellent add-ons to a night of beers. Normally I don’t order salads in bars, no matter how restaurant-y the bar is. But at Audubon, the grilled chicken salad is a fine choice for dinner. A generous portion with well-cooked chicken and fresh greens, my only complaint is that it can arrive over-dressed. Easily fixed by asking for the lemon-cilantro vinaigrette on the side, it’s both healthier and much better tasting than the taco or cobb salad most bar diners will be eating this weekend. The new entree list is where Audubon has made its mark lately, introducing two of my favorites- pork schnitzel and hanger steak. The schnitzel arrives with peppery arugula and pickled onions, two flavors that are an excellent compliment to the pork. The meat is juicy while still being a thin cut, and the breading is light, flavorful, and not greasy. The star of the whole menu, however, is the hanger steak. Perfectly cooked, the steak arrives fanned on the plate, atop a rosemary brown butter aioli. If I were to choose something from a restaurant to spend weeks trying to emulate, it would be this dish, this sauce. Also included is a potato gratin – a side that I don’t normally care for – with just the right amount of salt, and an appealing texture. Not too mushy, not too crunchy. Admittedly, this dish was made for fall/winter- eat it in the doldrums of summer and you’ll roll yourself home- but put it on your list. The only thing I really can’t stand about Audubon is the extremely pointy bar table that you must pass to get to the front door. I have almost impaled myself on it so many times (regardless of whether or not I’ve had anything to drink) that my companions now know to take me by the hand and guide me outside, lest I become a bar casualty. Note to the management: This is seriously hazardous. Invest in some kind of padding, or at least sand down that pointy edge, please. *all bets are off at the height of baseball season.